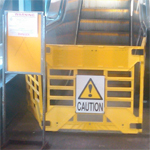 Escalator and Elevator Accidents Category Archives — Massachusetts Injury Lawyer Blog Published by Boston, Massachusetts Injury Attorneys — Breakstone, White & Gluck, P.C. A new report on a New York City elevator accident highlights the importance of safety on elevators, escalators and other equipment that transports the public. While many elevators and escalators are used daily by large numbers of people, they pose a risk for injury when they are not properly maintained. The responsibility falls on manufacturers to produce safe products and building owners, management companies and city and state inspection officials to ensure machinery is kept up to code. Elevator and escalator injuries and deaths are more common than the public may know. Each year, elevator accidents result in about 10,200 injuries and 27 deaths in the U.S. Escalator accidents result in about 17,000 injuries and 30 deaths. One tragic case recently occurred in Massachusetts. In March 2011, a 4-year-old boy was killed after an escalator accident in the Sears at the Auburn Mall, near Worcester. The child was standing on the store’s second floor when he grabbed the moving down rail of the escalator and was pulled through a gap between the Plexiglas divider and the escalator. He fell 18 feet onto a display case. Investigators later learned that the gap between the Plexiglas and the elevator was 1-1/4 inch greater than code. After an investigation, two state escalator inspectors were fired, six were suspended and 26 others were reprimanded. In December 2011, two women lost their lives in separate elevator accidents. On December 9 in California, a 48-year-old woman was killed on an elevator accident at Cal State Long Beach. She was killed when the elevator got stuck between the second and third floors and someone tried to help her escape. A 2000-pound car crashed down on her. Just five days later in New York City, a 41-year-old advertising executive was killed in an elevator accident in a Midtown Manhattan office tower. The woman was killed after she stepped into an elevator which suddenly lurched upward with the doors still open. She was pinned to an elevator shaft between the first and second floor and pronounced dead at the scene. Two other people who were trapped in the elevator were rescued and treated for trauma. The city released results of the investigation into the woman’s death this week, finding that a maintenance crew had been repairing the elevator and utilized a special jump wire to bypass the elevator’s safety system nine minutes before the woman’s death. They then accidentally left it in place. The investigation also found two other violations. First, the elevator repair crew never posted a warning that work was being performed. Second, the crew never called the city’s Buildings Department before putting the elevator back in service. The city has suspended the license of the company from performing maintenance, Transel, which services 2,500 elevators in New York City. The company has fired five mechanics. Transel Elevator Fires 5 After Report on Elevator Death, The Associated Press. Escalator fall leads to firings, suspensions, Worcester Telegram.